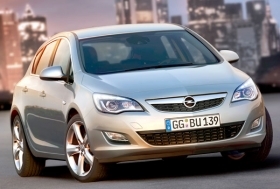 Opel/Vauxhall boosted Astra output 47% to 27,584 last month. MUNICH -- The big European production winner in October was Opel/Vauxhall. Led by a strong increase in Astra output, Opel/Vauxhall's production rose 77 percent to 87,246 units, according to J.D. Power Automotive Forecasting. The gain by the General Motors Co. subsidiaries helped to continue the stabilization of production in Europe. Last month's output was down by its smallest margin this year, off 2 percent to 1,511,612 units compared with the same period last year, J.D. Power figures show. Through 10 months, overall output is down 22.8 percent to 12,660,986 units in western and eastern Europe including Russia and Turkey. That is a improve from the 24 percent overall decline after three quarters.